Trichy district is situated almost at the geographic central point of the state Tamil Nadu. The district lies between 10° 48' 18o of northern latitude and 78° 41' 8.16o eastern longitude. Approximating the statistical norm, the elevation of the area is indicated at 88 metres. The topographic study of Trichy considering history of the place as indicated by its topography is virtually having a surface without slope, tilt in which no part is higher or lower than another. At the same time, the district features a few stranded mounds mounting higher up to the surface. Trichy spread over an area of 146.7 square kilometres bordered on the north by Salem District, on the northeast by Perambalur District, on the east by Thanjavur District, on the southeast by Pudukkottai District, on the south by Sivaganga and Madurai districts, on the southwest by Dindigul District, on the west by Karur District, and on the northwest by Namakkal District. Majority of Trichy's commercial and utility points like government offices, complexes and hotels are located in the Cantonment area. The northern part of city houses most of the city's renowned religious sites while the most happening bazaar street is situated right in the centre of the city. The four exclusive administrative divisions are further sub-divided into 60 wards where each ward is administered by a councillor. In recent times, the northern part of the Trichy experienced the emergence of numerous industries and residential areas as well. 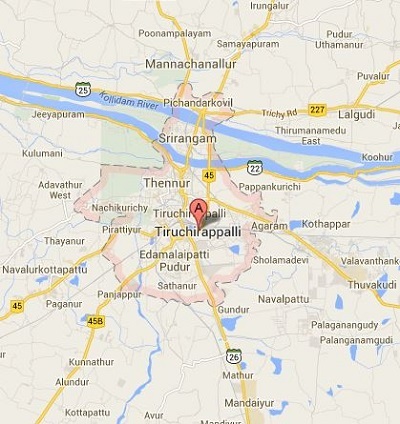 Trichy city is surrounded by agrarian lands on all side which is always special for a place. The island of Srirangam in Trichy district showcases many antique houses, which were built according to the shilpa sastras, the basic texts of Hindu architecture. In the year 1974, a Local Planning Authority was established for the district of Trichy based on the Tamil Nadu Town and Country Planning Act of 1971. Trichy is mostly hot and dry. The district experiences summer, winter and monsoon seasons. The hottest months of Trichy are between March-July, where the zone experiences “Agni Nakshathram”, one of the hottest periods in the Tamil calendar in which the zone suffers from hot days of the year with the highest temperature formally registered. The district goes through hot summer and cool winter. During the period of March-July, the district experiences warm and dry days and cool nights due to the winds of the south-east. There is a relief from the hot summer for people in Trichy during August-October, where the district experiences moderate climate followed by heavy rainfalls. During November-February period, there is cool and pleasant climate which normally excites the local population. Fog and mist are very rare occurrences in the district. But one may be lucky enough to enjoy them during winter season. North-East monsoon season in Trichy district occurs during November-December. During this period, the district receives intermittent rainfall. The district receives an average rainfall of 722.6 mm. The maximum temperature can go up to 37.2 ?C and minimum temperature can go down to 20.6oC.